Placed within a 90º angle, one can either face in or face out. A corner can either cage or cradle. By bringing together ambitious installations, wall drawing and sculpture, Cornered Rooms examines whether this particular space of experience serves to reinforce our fears of entrapment, or whether it can create a positive space for reflection. Post-9/11 architecture has highlighted the importance of exit strategies. Stephan Trüby discusses the advent of this new spatial orientation in Exit Architecture, Design Between War and Peace in a culture marked by risk-analysis and fear. Rather than welcoming ‘entry situations’, building codes show a desire for a way out. The corner is responsible for the awkward feeling of walls caving in and the impossibility of escape. By placing this situation alongside contemporary architecture’s preoccupation with ‘exit situations’, the corner may serve as a metaphor for our social condition. Angles of no escape can, paradoxically, offer the best view of all obstacles. Following the poet Noël Arnaud, in The Poetics of Space, Gaston Bachelard writes “I am the space where I am. […] Nowhere can this be better appreciated than in a corner.” By creating an opportunity to situate within, the corner creates a moment of physical and psychological transformation. 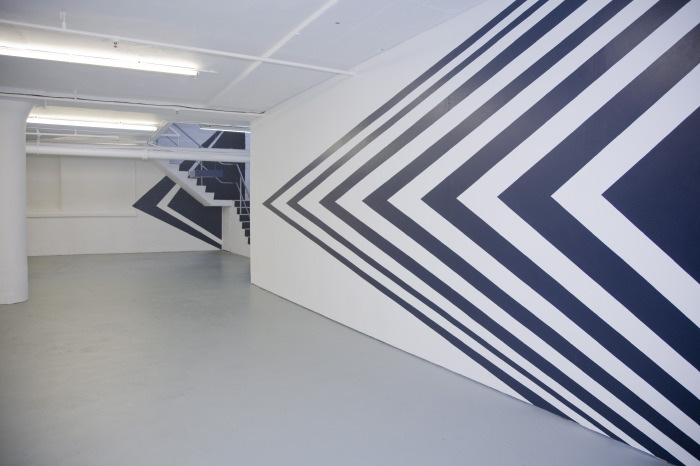 The two-dimensional arrangement of lines is collapsed and expanded into the gallery. The corners of the exhibition space appropriate the structures employed by the artworks. The exhibition will bring newly commissioned and previously unseen in the UK works by Hreinn Fridfinnsson (IS), Karim Noureldin (CH), Anna Ostoya (PL), Damien Roach (UK), Egill Sæbjörnsson (IS) and Patrick Tuttofuoco (IT). What does it mean to revisit Gaston Bachelard’s chapter “Corners” from the 1958 book The Poetics of Space if the new norm is a culture marked by risk and fear? Bachelard writes, “Our house is our corner of the world. As has often been said, it is our first universe, a real cosmos in every sense of the word.” Where do we live today when we are constantly reminded of our insecurities and unsafe interiors marked with escape routes and emergency exits? Cornered Rooms analyzes corners from a physically and emotionally claustrophobic perspective. According to Bachelard, the corner is the origin of a room, in which to hide and withdraw. He goes on to define a corner as a secluded place for the imagination. However, as the works in Cornered Rooms will prove, the corner can’t guarantee a moment of immobility, for it is a chamber of being without security. ‘Exit architecture’ as defined by Stephan Trüby in his 2008 book Exit – Architecture: Design Between War and Peace is a key concept for this project. Trüby asks how buildings shape us and historically traces the development of anti-panic architecture. Today, constructing buildings begins with exit solutions rather than entry options. However, Trüby writes that escape routes are ways home, but rotated 180 degrees. The corner may be guilty of having a seductive power of pure geometry and becoming an ‘ideal concept’, and it is clearly a subject worth studying. Displacement or entrapment occur at the point where time and space intersect. The corner is a meeting, a three-dimensional expanse of walls between a floor and ceiling, and constructs the room to move within. The corner frames both the inside and the outside, as well as the subject’s position and experience. How can we revisit ‘the corner’ previously known as a place of safety and prized immobility? Whether allegorically or literally trapped, whether facing in or facing out, we ponder what will happen next. The corner in Cornered Rooms is presented as a self-sufficient material form. Many works within the exhibition are tangible corners, use the corners of the gallery space, or problematize the corner’s intelligibility within an escape route framework. The works hide nothing and reveal forms displaced and configured anew. 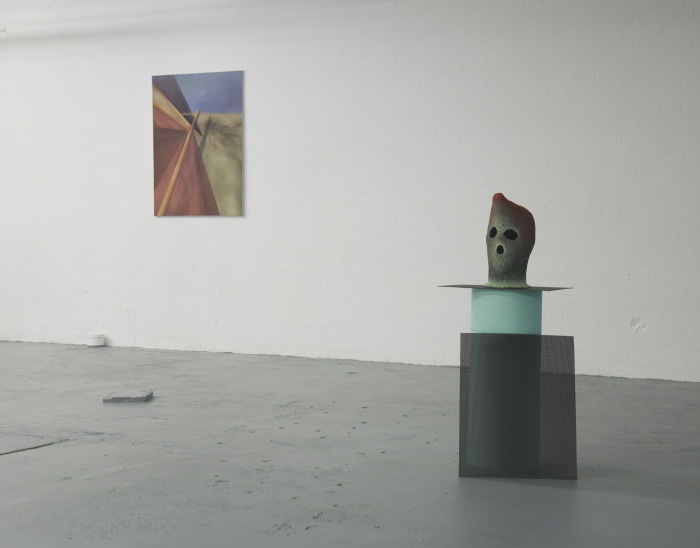 There is a ninety-degree angle sculpture by Friđfinnsson, angled rays painted by Noureldin emerging from a corner, and boxes projected onto and placed into a corner by Sæbjörnsson. The installations, painting, and sculptures play with the form of a corner and the products of its imagery. This corner becomes a tool to cross-reference art, architecture, and language. Locating new contexts for corners, the works give rise to different visual mechanisms that enable transformation. Egill Sæbjörnsson’s work is an approach to experience, a mode of behaviour, a play. His oeuvre is performative in nature and entails the theatrical-artistic while playing with the image as interruption. 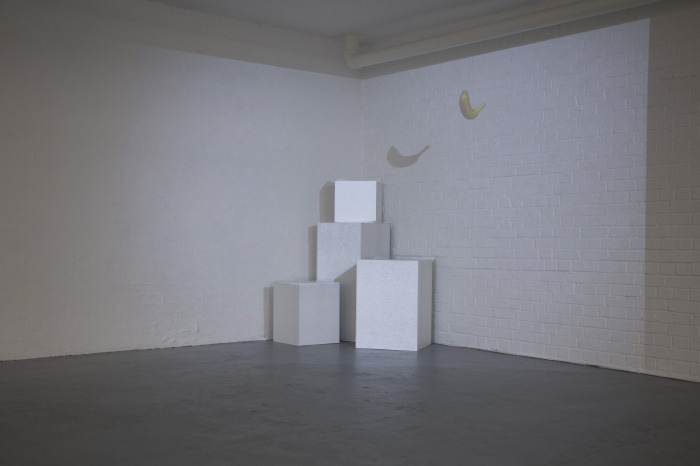 A flying banana, magical numbers, or sounds of rainforest insects are encountered in Sæbjörnsson’s installations of animation, performances, and objects on display. Practical objects from everyday life become alive as in Five Boxes (2009). A sound and a silence tread fantastically by way of unification and separation. The animation humanizes space and ideas while questioning the nature of images. The unstable nature of the projected images disturbs the objects’ physicality. The projected image ‘syncs’, returning to the ‘real’ image after taking a brief journey through time and space. The unstable circulation of images allows for a brief departure for a possible escape from boxed-in realities. The boxes in Five Boxes dance to generate Sæbjörnsson’s futuristic tableau vivant. The conceptual artist Hreinn Friđfinnsson’s work entails photography, drawings, and installations, exploring notions of the self and of time. 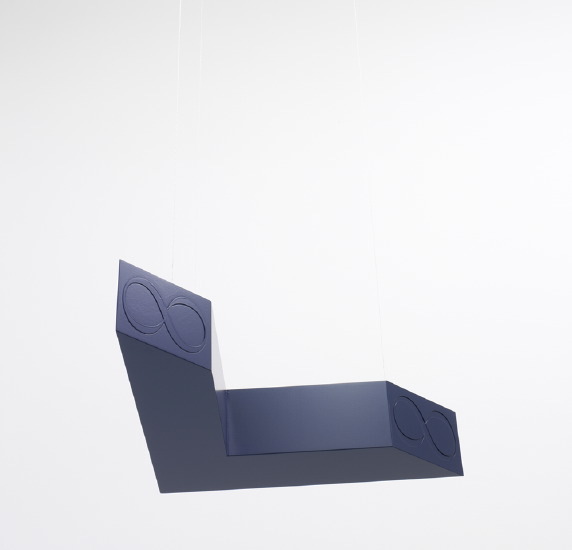 Upon entering the exhibition, the viewer finds a floating sculpture which merges a twofold representation of the corner imagery: the geometry of two vectors and the poetics of a corner. Bláhorn (2010), the title of a ninety-degree infinity-angle, meaning ‘blue corner’ in Icelandic, is an invented word. The corner in association with the colour blue is significant: there is a saying “the distance paints the mountains blue”. Blue-something means being at the edge or the end, hanging by a thread. The work defines a corner as a familiar geometric form and discovers an ideal inspired corner. Symbols of infinity - one embossed and one impressed - are found at the ends of the sculpture. The work is a mythical corner, and together with three others, will form a conceptual and paradoxical infinite square. Bláhorn represents an endlessness, which the blue corner simultaneously renounces and surrenders to. Without a single image, Damien Roach’s installation becomes life-art. Invisible yet inescapable to the viewer’s ears is the sound installation Rain (2010) made using a found recording of rain hitting a tin rooftop. Roach is interested in the mechanics of cognition and here uses sound to produce a real feeling. Respecting the liberated viewer, and through minimal means, he creates a new environment which functions as a cue for a small but very real shift in psychological state. Listening to the play of rain outside from an interior connects one to a crucial sensation of domesticity. Roach reminds the viewer of everyday life while softening the dichotomy between inside and outside into one of coexisting worlds. The interior condition valued as favourable can only exist with a conscious knowledge of the contrast between itself and the world outside. Roach’s scenario of precipitation-as-audio-experience highlights the simultaneity of facing both in and out, or rather, poses the idea of a ‘facing out’ as the producer of the possibility of a ‘facing in’. Anna Ostoya analyses the complexities of social problems from historical and psychoanalytical perspectives in relation to the contemporary world. Western civilization is based upon the classical order. 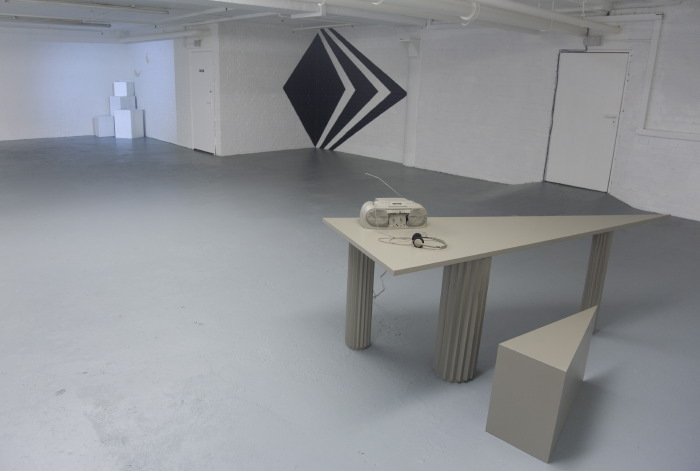 In Saturday Afternoon, 1st December, Leeds (2007), archaic columns serve as the legs of a triangular table that holds a CD-player from which the visitor can hear a text about Leonia. The description of this imaginary place from Italo Calvino’s 1972 book Invisible Cities, is read here by the Polish sociologist Zygmunt Bauman. Modernization and consumerism are of interest: the city of Leonia renews itself daily, engrossing neighbouring cities with its waste. Leonians’ obsession with everything new has resulted in mountains of garbage close to collapse. In his writings, Bauman uses Calvino’s magical urban description to explain his theory of liquid modernity where social relationships, like goods, are easily exchangeable, and thus short-lived projects; uncertainties prevail. A further testimony to this architectural transmission is Ostoya’s painting A Sense of Perspective and Other Attempts (2008), which takes a contemporary newspaper image as its source. The angles and perspective point to and distort the photograph of children living in a garbage field among mounds of waste. Bachelard writes, “Every corner in a house, every angle in a room(…) is a symbol of solitude for the imagination; that is to say, it is the germ of a room, or of a house.” It is from this germ that Karim Noureldin’s site-specific room drawing Sunsunset (2010) originates. Noureldin creates a new visual reality out of the familiar and the sublime. The work brings the outdoors in, displacing and abstracting a representation of nature. Dark hues of blues and blacks replace ‘romantic’ pinks and yellows, as luminous rays turn into sharp angles hich resemble arrows pointing outwards. The rhombus-shaped sun is seductive in its precise and determined projection. Enticing yet alarming, the repetitive rays project escape routes. Referring to the act of drawing, Noureldin’s wall painting creates a spatial structure framing movements of vision which guide the viewer elsewhere. Logically, the starting point for the discussion of these works within Cornered Rooms is the human being. The word ‘person’ in its original Latin refers to the actor’s mask. The Canadian sociologist Erving Goffman writes, “In a sense, and in so far as this mask represents the conception we have formed of ourselves - the role we are striving to live up to - this mask is our truer self, the self we would like to be.” Patrick Tuttofuoco’s sculptures Michael and Aaron (2009), both masked, are assumably of human heads. In Michael, the brightly coloured burglary mask stands on a ‘concrete’ plinth and with a pigeon-spike to ward off imagined urban ‘flying rats’. The mask both reveals and conceals, as it simultaneously protects and is feared. Strangely, the human subject underneath has vanished, and it is only the shape that remains. This uncanny image cannot hide, and the question of the person underneath persists. Who is accountable and what role does he or she embody as a perceiving subject? Have Michael and Aaron left to escape from their own corner of existence? Escape to where? Hreinn Fridfinnsson has been at the forefront of the development of conceptual art not only in Iceland, but also in Europe, influencing generations of artists since the 1970s. His work is celebrated for its lyricism and stark poetry that transcends the often-commonplace subjects and materials that he uses. Fridfinnsson presents found objects with which he interferes to a minimal extent, often creating new works that investigate the ideas of the self and of time. Although there is a consistency of theme and a common emotional thread to his art, the media that Fridfinnsson employs are remarkably varied in scale and substance, from photography, drawings and tracings to presentations and installations of sound, texts and ready-mades. Bláhorn (2010), meaning ‘blue corner’ is a structure of MDF, steel and lacquer whose title mirrors the inquiry of the exhibition. The structure is inviting and open, indicating infinite expansion. In Icelandic, blue-something means being at the edge or the end, being narrow and tight, and hanging by a thread. Karim Noureldin's geometrical abstraction opens new spatial dimensions. The meticulously executed colourful wall works, described by him as ‘room drawings’, create a multitude of visual scenarios. For Noureldin, abstraction is an international language with local dialects, and his work is based more on intuition than on calculation and deduction. The imposing rays of Sunset (2005) project escape routes but also consume the occupier, offering a darker, more contemplative space. The emotional contingency projected from the work invites the dreamer, without excluding the world outside. Anna Ostoya’s work spans multiple aesthetic traditions, drawing on art history, theory and literature. Ostoya’s practice poses complexities of social problems such as war and economics. She analyses these issues from historical and psychoanalytical perspectives in relation to expressions of masculinity. Ostoya studied at Parsons School of Art and Design in Paris and at Städelschule in Frankfurt am Main. In 2008, she participated at the Whitney Independent Study Program in New York City. This year, her solo exhibitions include Galeria Foksal in Warsaw and Center for Contemporary Art Kronika in Bytom. Previously her work has been presented at the Portikus in Frankfurt am Main, Zacheta National Gallery in Warsaw, Manifesta 7 in Rovereto (2008), 2nd Athens Biennale, CAR Projects, Bologna and Lisson Gallery in London (2009). Saturday Afternoon, 1st of December, Leeds (2007) is a sound sculpture, consisting of a domestic CD player and a triangle shaped table with a seat. A Sense of Perspective and Other Attempts (2008), an oil painting accompanying the installation was based on an image from a newspaper depicting children living on a garbage field. The audio element presents the chapter "Leonia" of Italo Calvino’s novel Invisible Cities (1972) read by the sociologist Zymunt Bauman. The fictive city Leonia is renewed daily and its inhabitants are very proud of its constant modernization. They do not notice the mountains of waste produced by this process. Bauman has sourced Leonia as a metaphor for his theories about the postmodernist consumer society. Damien Roach’s practice is an ongoing investigation into modes of perception and understanding, analytical thought, creativity, and mental freedom. Using video, sculpture, sound, installation and collage, Roach’s works are stand both individually and in groups, to present dynamic constellations of possibility, weaving dense tapestries of connections and paths through ideas and images. Roach studied at the Royal College of Art London, and has recently exhibited in solo shows at Meessen De Clercq, Brussels, David Roberts Art Foundation, Sies + Höke, Düsseldorf, IBID Projects, Gasworks, and also at 176 Project Space, Level 2 Gallery at Tate Modern, and Schirn Kunsthalle, Frankfurt and Swiss Institute, New York. Roach will create a new, site-specific work for Cornered Rooms, responding to the architecture of the gallery. Egill Sæbjörnsson is a musician as well as an artist and continually appears in new roles. He creates arrangements that cannot be described as mere installations and are seen by him as a (techno)logical continuation of painting. They are all at once performance set, sculpture and three-dimensional drawings. Sæbjörnsson invents his own media and creates a fantastical world populated by animated objects, singing plants, and anthropomorphic heavenly bodies. He has exhibited in Hamburger Bahnhof Museum of Contemporary Art in Berlin, Kölnischner Kunstverein, DeAppel in Amsterdam, Museum for Contemporary Art in Reykjavik, Museum of Modern Art in Sydney, and Kunsthalle Wien. In his practice, Sæbjörnsson playfully looks at reality and its projections. In Five Boxes (2009), a constellation of objects - some real, some imagined - try their best to escape the gallery frame. Their outlines, however, are literally boxed in and return to the physicality of the four wooden structures. Patrick Tuttofuoco’s practice reflects his utopian ideals and his interest in society, cities and community. He is best known for large-scale sculptures, which synthesize global architectural elements. Recently, Tuttofuoco has moved to making smaller works that focus less on the architectural elements and more on the human perspective. Tuttofuoco studied architecture at Politecnico in Milan and Fine Art at the Academy of Fine Art of Brera, Milan. He has recently exhibited at Künstlerhaus Bethanien in Berlin, Fondazione Sandretto Re Rebaudengo in Turin, Museum of Contemporary Art Chicago, and the 10th Biennial of Havana. Michael (2009) is colourfully spray-painted masked head formed from balaclava headgear. Although the sculpture is cast to an individual’s head, the face underneath is absent. Adjacent to the scupture’s plinth is a pigeon-spike - an urban accessory of protection. Transformed through time, Michael represents the human being who has been shaped by his environment. Annabelle von Girsewald is a curator and PhD candidate at the London Consortium. She obtained her MA in Cultural and American Studies from the University of Tübingen and her BA in Women’s Studies and Art History from the University of Wisconsin Milwaukee. Her curatorial research here is process-orientated. Her aim is to reconfigure the notion of ‘home’ together with artists, curators and architects, and by revisiting thinkers such as Frederick J. Kiesler and Gaston Bachelard. In 2005 and 2006 von Girsewald curated a trilogy of exhibitions: Home is where the Heart is, Home is where the Hurt is, and Homing Desire. In 2007, she organized the conference HomeBodies at Birkbeck College and in 2008 curated HomeBodies at Atelier Frankfurt. The exhibition is supported by Pro Helvetia, the Swiss Cultural Fund in Britain, Center for Icelandic Arts, Embassy of Iceland London, Adam Mickewicz Institute as part of Polska! Year, Enigma FX and ArtAV, and The London Consortium. We gratefully acknowledge the support of Mr James Ellery and Wonder. We would like to thank the artists, Isabelle Maidment, Steve Connor, Anna Julia Fridbjornsdottir, Börkur Arnarson, Júlia Marí Bernaus, Maxa Zoller, Anna Tryc Bromley, Vigdís Pálsdóttir, Josh Love, Annie Rudnick, Nock Joyce.